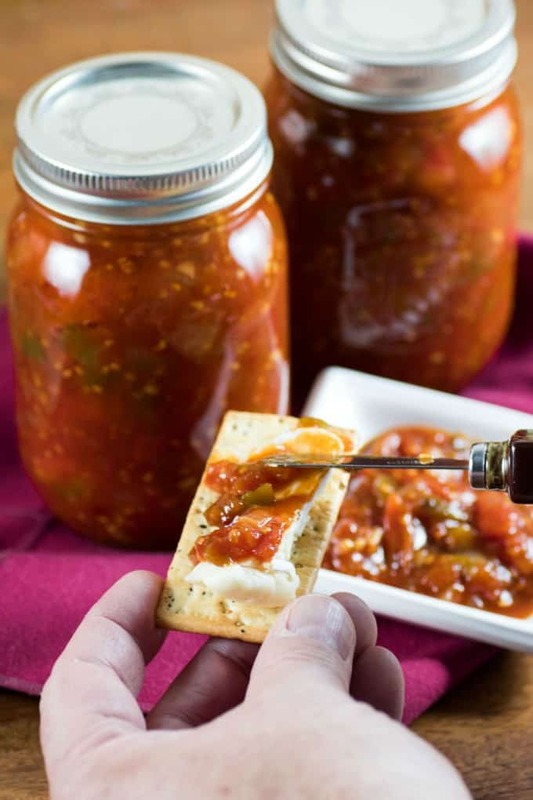 Tomato Jam Recipe using cherry tomatoes for an amazing condiment. I was introduced to a tomato jam when I was in Seattle at the beginning of the year. I had ordered a healthy breakfast and it was an egg white omelet with poblano peppers and tomato jam on top. Trying just this one recipe I was instantly hooked. Later that day I sourced some tomato jam while we were at the Pike Place Market. Now that it is long gone I have to source my own Tomato Jam Recipe. We had an abundance of little cherry tomatoes this summer so I decided to make my own recipe using them. You could also use roma tomatoes. 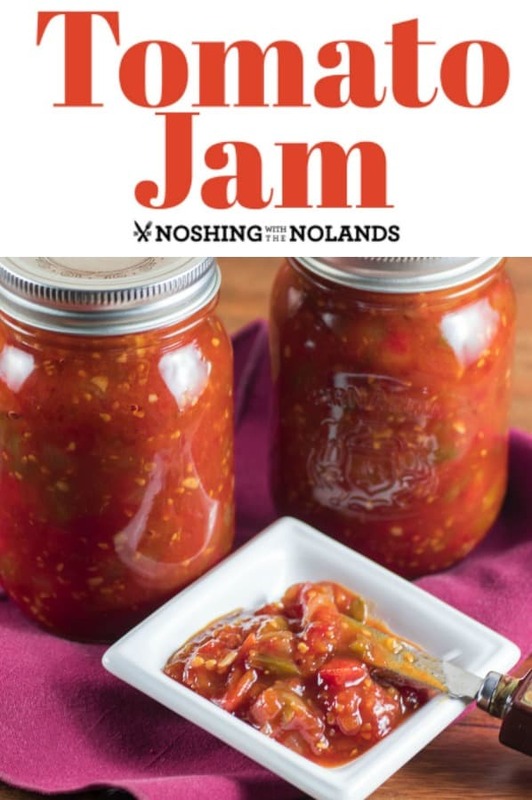 We love to can tomatoes here or make them into a salsa so canning this tomato jam recipe was easy. Once you get into canning you will be hooked. This is a good recipe as it is simple and you don’t have to spend time seeding and peeling tomatoes which can always be a chore. 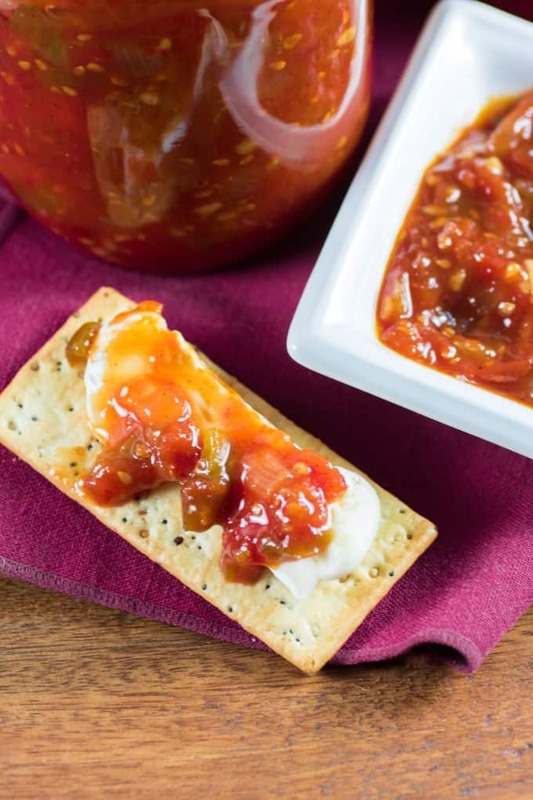 This is not a spicy tomato jam but one that is sweet and savory. I think I have just the right amount of heat with a scant teaspoon of red pepper flakes. It just gives a warming feeling to it. To make a great tomato jam recipe you simple need great produce. Make sure your tomatoes are wonderful tasting and that is half the battle. You want fresh tomatoes that are unblemished and ripe. To know if a tomato is ripe it will yield slightly to pressure when gently squeezed and have a slightly fragrant aroma. If they have a pungent aroma they are probably over ripe and shouldn’t be used. How Do You Make Tomato Jam? The recipe comprises of tomatoes, onions, green pepper, and garlic, which are all pretty standard. It is then spiced up with red pepper flakes, sugar, pickling salt, cinnamon, ginger, allspice and cider vinegar. All of these ingredients make the perfect tomato jam recipe, you will love it. Another tip that you need to know is that you can’t use iodized salt for canning. Use a pickling salt which can also be called canning salt or preserving salt. Pickling salt is a pure granulated salt (sodium chloride). Iodized salt can turn your produce black in color and your liquid cloudy. Kosher salt can also be substituted but because it is so much coarser you need more salt, about 50% more and it also takes longer to dissolve. 1 1/2 tsp. of Kosher salt would equal 1/2 tsp. pickling salt. I just stick to using pickling salt so I don’t have to change measurements in the recipe. Would you like it a bit spicier? Just amp up the amount of red pepper flakes! You can always taste this as it goes to see the spice level that you are comfortable with. There is no need for any pectin in this recipe, it will thicken as you cook. Just boil it gently while stirring occasionally until the mixture is just thick enough to mound on a spoon. What Do You Eat with Tomato Jam? We have had a tomato chutney or chili many times and have always loved it with Tourtiere for the holidays! A tomato jam is very similar to these and goes perfectly with the savory meat pie. Add it to a grilled cheese sandwich or a ham and brie! Dollop onto soup along with sour cream, great with a Middle Eastern lentil soup. Try it with eggs of any kind, scrambled, sunny side up, omelet. Makes a great condiment for a burger! Douse it onto a hot dog! Smear it on fish or pork! Use it with cream cheese on a bagel. Serve it with a charcuterie. Slather it on a cracker with cheese as shown above. Spread on as a base for a savory tart or a pizza. Mix it into cream cheese with mayonnaise as a party dip. Use it in a meatloaf instead of BBQ sauce or ketchup. Make it in small 4 oz. jars and give it as a gift. Can You Freeze Tomato Jam? 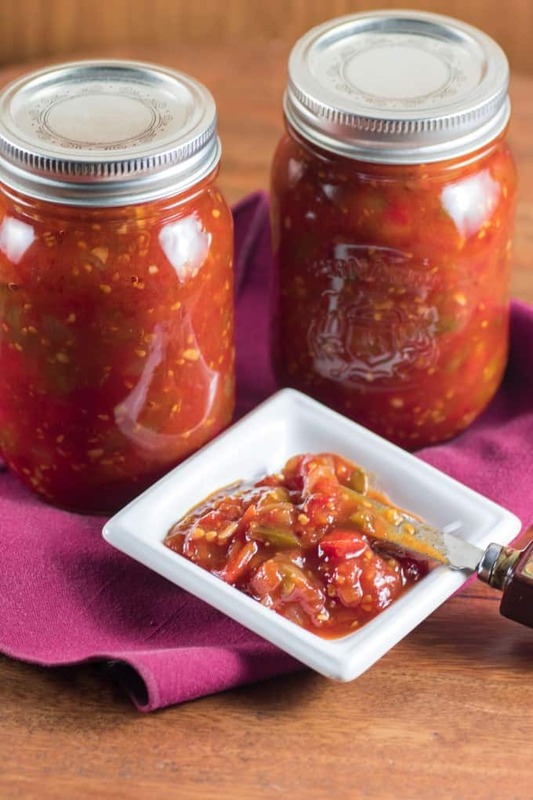 If canning is just not your thing don’t get your buns in a knot, you can freeze this tomato jam just fine and use it jar by jar or give it away as gifts. How long does tomato jam last? Stored in the refrigerator the tomato jam will also last for about 3-4 weeks after opening. Another thing to note is that you have to adjust cooking times for high altitude canning. This is required here in Calgary as we are above 3,000 feet. It is an easy solution if you follow this guide. You can easily make double batches of this recipe if you would like to make more. Some other of our recent favorites for canning are Pickled Green Beans, Quick Pickled Onions and Spicy Refrigerator Pickles. Jams, jellies and mustards have been popular too, both sweet and savory. Recently we made a Blueberry Rhubarb Jam and also in the past Brandied Cinnamon Apple Preserves, Crabapple Jelly, Red and Green Pepper Jelly, Jalapeno Jam and Homemade Sweet Hot Mustard. Canning is one of our favorite things to do with great fall and summer produce. 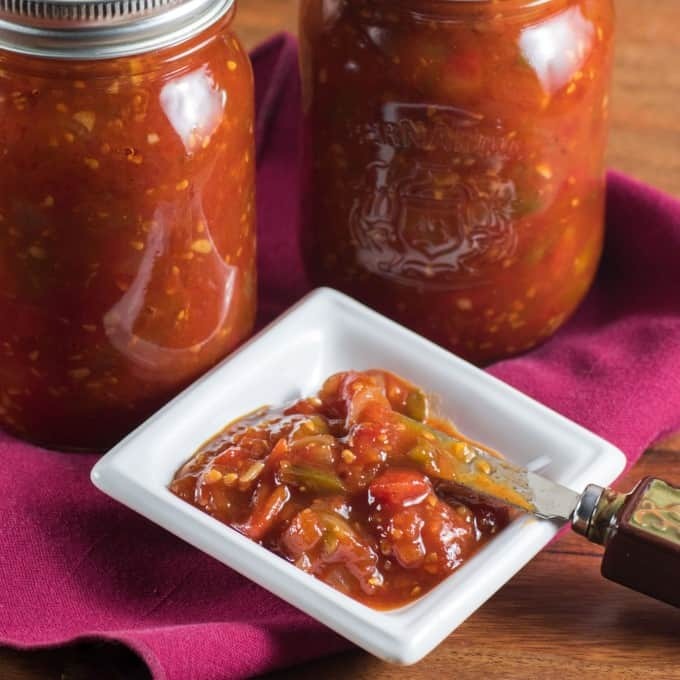 Tomato Jam Recipe Author: Tara Noland Tomato Jam Recipe Recipe Type : Condiment Cuisine: American Author: Tara Noland Prep time: 20 mins Cook time: 55 mins Total time: 1 hour 15 mins Serves: 4 - 8 oz. 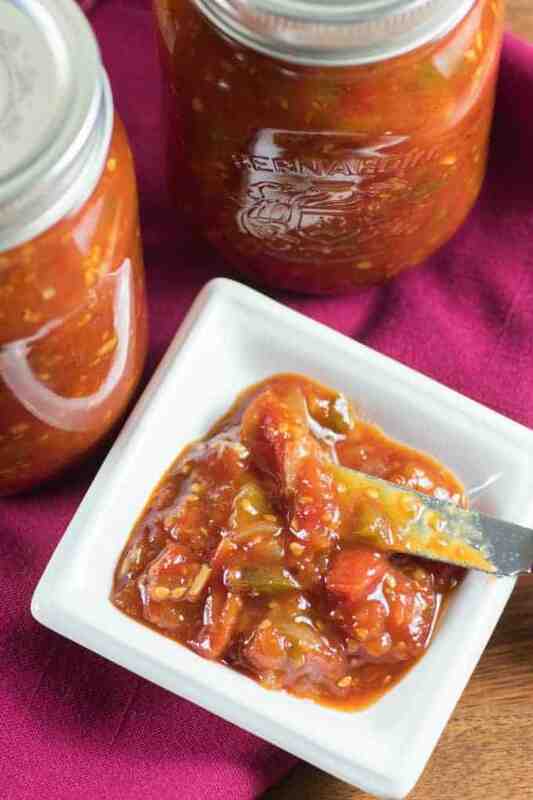 jars Tomato Jam Recipe is a fantastic condiment to go with so many entrees. It blows a simple ketchup away! Make some also to give as presents for the holidays! You can skin the larger roma tomatoes by putting an "x" in the bottom of them with a knife. Drop them in boiling water for a minute and then remove. This will allow the skin to just peel off. I left the cherry tomatoes with the skins on. In a large heavy-bottomed pot add all ingredients and stir well. Bring to a boil over medium heat while stirring often. Reduce heat and cook for about 45 min. or until mixture mounds on a spoon. Ladle into sterilized jars to ½" below the rim. Remove air bubbles and add more jam as needed. Wipe rims and place on sterilized lids. Tighten rings to fingertip-tight. Process jars in a boiling water canner for 10 min. Take lid off and turn off stove but leave jars in the water for 5 min. Transfer jars to a towel lined surface and let rest until they come to room temperature. Make sure jars have sealed. Refrigerate any unsealed jars for up to 3-4 weeks. Recipe adapted from Best of Bridge Home Preserving. YUMMMMMMM!!!!!!! I just made a batch and it’s now cooling in the kitchen. We tasted it before canning and one of us thought it is perfect as is but the other would like more heat. Maybe another tsp of chili pepper flake? Also, I had to boil it for 2 hours before it was thick enough. Maybe my tomatoes were juicier than yours? Thanks for the post! So glad you made it and you came to tell me! Great tips for this recipe, ENJOY!! Ooh, that sounds really nice. I’m liking the meatloaf and meat pie idea. I’d definitely add plenty of red pepper flakes. I MUST make this! I’ve always been one to put sugar in my tomato sauce, so I know something like this is going to be tasty! Oh WOW! I’ve never had tomato jam before – I love that you put ginger and cinnamon and allspice in it. That seriously sounds amazing! This looks so delicious! I bet it would be delicious spread on some bread to make grilled cheese. Great idea – I’ve been looking for new ways to use my canning jars too! yum! I have never heard of tomato jam. It sounds good though. I really prefer savory over sweet. I have never heard of Tomato jam but after reading about it in your post I would definitely give it a try. I love that you included all of the things you could use it with. It sounds delicious. This looks so good! I would love to give it a try! I’ve never heard of tomato jam before but it sounds like a delicious breakfast condiment. I still have tomatoes coming out of the garden so I will save this to try soon. I’ve never had or even heard of tomato jam. It looks so delicious. This is going on my must make or find some to taste list. I’ve never heard of tomato jam! What all do you think it tastes good with? I can’t wait to try it but I want to make sure to understand! Plus what a great holiday gift. Hi Autumn, in the post there is a whole list of things that this tastes great with. Have a look! I love tomato jam and this recipe sounds great with the warm spices. How do you address the tomato skins? I usually roast them (romas and cherry) first – the skins slip right off. I would hate to make a big batch of jam and have all those skins just hanging around. Thanks. I made a note that if you are using the roma tomatoes you can skin them. I didn’t skin the cherry tomatoes and they were just fine. Their skins are very tender and soft.